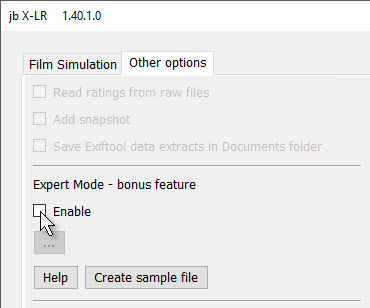 The Help button displays a longer explanation of how to decode Fuji tags, while Create Sample File generates a sample Expert Mode definition file. Expert Mode is included because I don’t intend to include all the in-camera settings like dynamic range, sharpness etc in the core plugin. X-LR needs a clean interface that works for 99% of users and focusses on the really important job. But some users want to figure out other Fuji tags and use them to set presets and slider values. It’s not particularly difficult, but Expert Mode is not for everyone. Expert Mode is only a bonus feature. It should work, but don’t buy the plugin for it. If you have a question, you should not expect support – if you ask nicely, I might reply, but please don’t depend on it. The plugin’s Help button displays a file that explains exactly how to use Expert Mode, so this is a summary intended to let you assess whether you would be able to take advantage of it. the value for that slider – or the preset’s ID. You can see the names of Fuji tags if you use the option to save the Exiftool data extract and review the text files saved to your Documents folder. Alternatively, run the plugin with the keywording option and examine the Keywords panel. Lightroom’s slider names can be seen if you open a preset in a text editor. I translates “a internal error is occured” from german. I use the registrated Version 1.41.2.0. Sorry for my worse english. Thanks for letting me know – I will test it. Which version of LR are you using? I work in environments (film sets) that require custom kelvin white balance and then in addition, I toggle the joy stick on the back of the x-t2 to remove blue or remove red etc. This is done in order to match what the DOP has on his monitor in the dit tent so that my stills match his vision on the Arri. At the moment, I have to shoot jpg + raw so that these settings are applied to the jpg, then when at home and in Lightroom, I try my best to match the raw to the jpg. Once there, I make my presets and apply to the batch of raws. Long winded, but the questions is, does this plugin apply my tweaks to the white balance? Thanks! It should do so, and it would be in the Expert Mode. You would need to figure out how the camera is recording the settings you have tweaked. Probably the best way is to try out the plugin on 5 images, checking the box to save the data extracts. 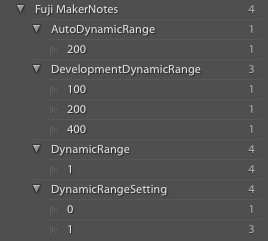 You can then examine the Fuji settings and create a definition file as above. The plugin’s Help file explains this a bit more. Is there the possibility to also add a rule for normal EXIF data in the csv file? E.g. if I would like to set the Grain in LR depending on the ISO value which is not part of the MakerNotes, how do I do this? Not currently possible, but I’ll think about it. Is there any documentation anywhere on available Fuji tags? Is that found in EXIF data? Somewhere else? I’d love to be able to at least approximate shadow tone and highlight tone. No, I know of no documentation. These tags are in the EXIF in a section called MakerNotes which camera makers use to record their own settings. You can see them if you use the option to save the Exiftool data extracts – this saves the data as a text file in Documents. It’s not exactly full documentation but at least list all the tags and enumerates the values they can have.